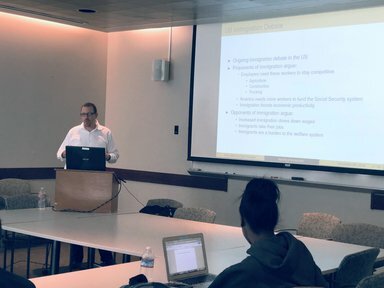 The UCD Gifford Workgroup brings together graduate students and faculty in an interdisciplinary setting to discuss population- and migration-related papers. The Workgroup provides a forum for discussion of work in progress and recent publications. The topics discussed include immigrant incorporation, immigration policy, social demography, transnationalism, citizenship and political participation, intra- and inter-group relations, health and social welfare, and the impacts of immigration on the labor markets and the economy. For further information please contact Philip Martin. 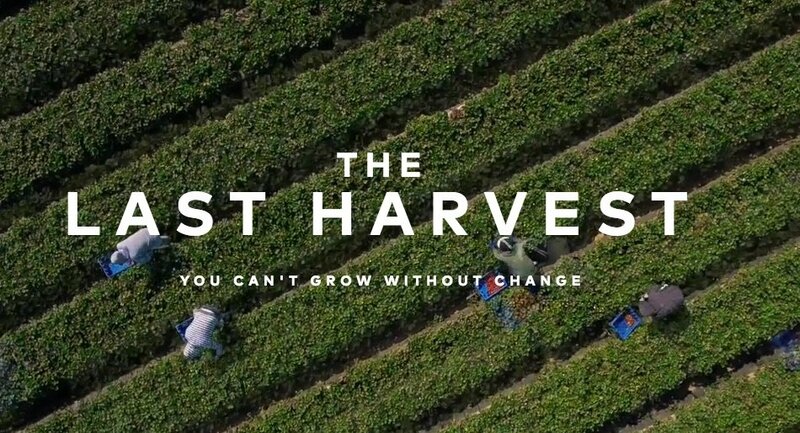 Farm League and Driscoll’s Berries produced an 18-minute film, The Last Harvest, to stimulate discussion of immigrant workers in California agriculture and the options available to harvest labor-intensive commodities such as strawberries. A diverse group of faculty and students responded to the film, offering critiques that stressed the need to consider farmers seeking more workers and workers seeking higher wages and more opportunities. Ag economics graduate student Zach Rutledge explored the impacts of immigration on wages and employment in six sectors in 150 MSAs including construction, and found negative impacts using ACS data He found a positive correlation between more immigration and better economic variables, but analysis of regional and time variation found a negative relationship between the foreign-born share of the labor force and GDP, per-capita GDP, employment, native employment, and per-capita income. Most of these negative effects dissipate in the longer-term. This paper provides empirical estimates of the short-run impacts of immigration on the employment opportunities of US-bornworkers based on a novel sectoral approach. We focus on six economic sectors with low skill requirements and high shares of immigrant workers. Our inference is based on panel data at the metropolitan area-year level of aggregation. We instrument for the sectoral share of immigrants using the share of immigrants in all other sectors of the economy. Our strategy yields conservative estimates of the effects of immigration on native labor outcomes because (i)movement of capital and native labor across metropolitan areas reduces the extent to which intercity comparisons can account for shocks to native employment conditions, and (ii) our instrument for the immigrant share likely remains correlated with sectoral native labor demand shocks, albeit less so than the sectoral immigrant share itself. We find evidence of negative short-run effects of immigration on native earnings in the construction, food service, and personal service sectors. Upper bounds on the annual earnings impact of a 10 percentage point increase in the share of immigrant workers range from -2.9% to -6.6%. Earnings impact estimates in other sectors are generally negative but not always statistically significant. Effects on the native employment rate are negative and significant across all six sectors. I appreciate the sectoral focus and the introduction to this new methodology. It introduces some interesting possibilities. The results are interesting in that they emphasize a bound on the particular impact immigration might have had on native workers in particular sectors–the workers in which may find it more dicult to easily transition into new occupations if their labour market opportunities declined.  The authors nd large and signi cant decreases in earnings as the result of immigration–particularly in certain occupations in the construction industry and in certain service sectors. 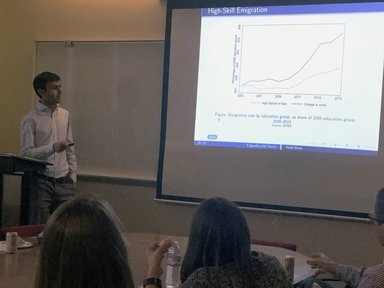 Economics grad student Giuseppe Ippedico examined the impacts of the exodus on Italian cities due to prolonged periods of slow growth, and found negative effects on the cities with the highest rates of out-migration. The challenge is to find Italian cities that are otherwise comparable but have different rates of educated youth out-migration in order to measure the effects of differential rates of out-movement on those who did not move. The argument for this paper is intuitive. If most college graduates in the city of Davis suddenly leave, this exodus would have a negative economic impact on the city. The empirical challenge is to demonstrate the reverse story does not hold: negative impact causes most college graduates to leave. The authors use an instrument variable of “pull factors” prior to the economic recession to measure the effects of youth drain on the Italian economy, and conclude there is a negative effect on economic outcomes.